Sprague & Nelson in the bell. 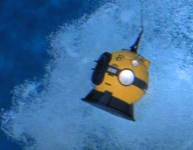 On a research mission in the diving bell, Nelson, Sharkey and geologist Elton Sprague are caught by a surprise tidal wave, and the diving bell, it's cable snapped, is carried away and comes to rest on an uncharted island. Crane and crew are frantic to effect repairs to Seaview and get a search underway for the missing bell. Nelson opens the bell's hatch for air; a loud roar announces the presence of a dinosaur, and they are soon under attack. Nelson drives the beast away with some well placed laser gun fire and Sharkey sets about trying to repair the radio. 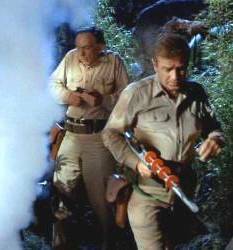 Sprague stumbles into a steam geyser and comes under the spell of its hallucinogenic mist. 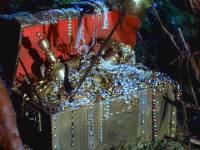 He's soon gallivanting off after a pirate figure who teases him with suggestion of treasure. 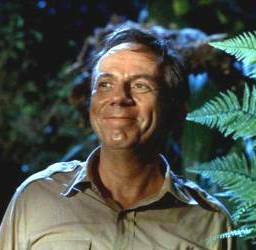 Sharkey has success with the radio and Nelson gets through to Crane, just to be cut off by another dinosaur attack. 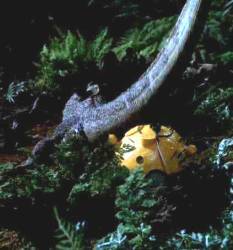 With the creature intent on attacking the bright yellow bell, Nelson and Sharkey footpad for cover just before the bell is smashed irretrievably by the giant beast. They have no recourse but to try to find the beach so they can signal for help, along the way experiencing hallucinations of their own: Sharkey sees monsters and Nelson sees Crane. They eventually all wind up on the beach with Seaview offshore. Nelson orders a missile fired to destroy the dinosaur and then he runs for a cave's cover and Crane and Sharkey row like hell before the missile hits. 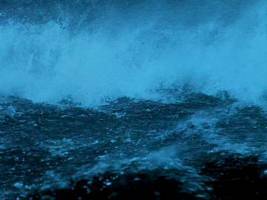 They all return to Seaveiw and the island is obliterated by a second tidal wave. Sub and crew are off to new adventures. Diving bell about to get mashed irretrievably. 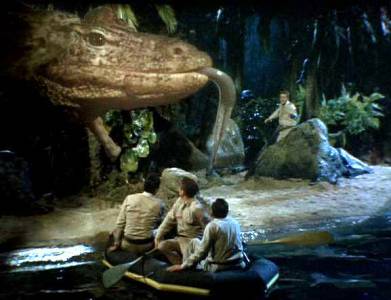 Trivia: The original plan was to use a live crocodile for the monster scenes but it was decided that the giant iguana would be easier to work with. 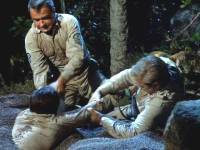 Mark Says: An early casting memo for this episode suggests Martin Sheen for the role as the geologist. He would have done better than Henry Jones’ annoying Dr. Sprague, whose "Dr. Smith" antics wear thin after awhile. 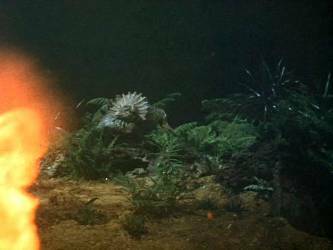 Otherwise, the story is fairly interesting, mainly due to the remarkable special effects, including the tidal wave and the giant lizard destroying the diving bell and threatening Nelson on a beach. To put the old misinformation to rest, the lizard sequences are all new. 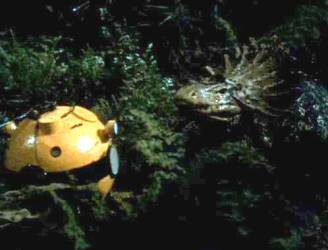 There’s not a stitch borrowed from Irwin Allen’s The Lost World. Nice tidal wave was the only stock-shot in the house. I'm guessing black & white tinted blue--Mike. 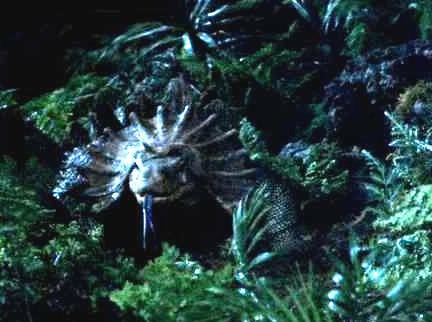 Detailing and minute size of jungle miniature amplifies the size of the iguana. 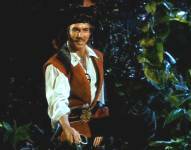 almost like a comedy in many places -- certainly in those scenes with Dr. Sprague and the ghostly pirate. 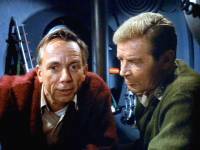 The acting style of Henry Jones tends to put a smarmy kind of gloss on events which worked with his other Voyage character, Pem, but not here. 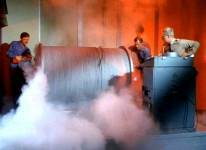 In spite of all these negatives, it's worth watching for the great special effects, which as Mark points out, were all (with the exception of the tidal wave, as I recall) created for this episode.